It's hard to believe that after 5 years the Fir Street Bridge is finally open. It has been open for a few days but the celebration will be this Friday. 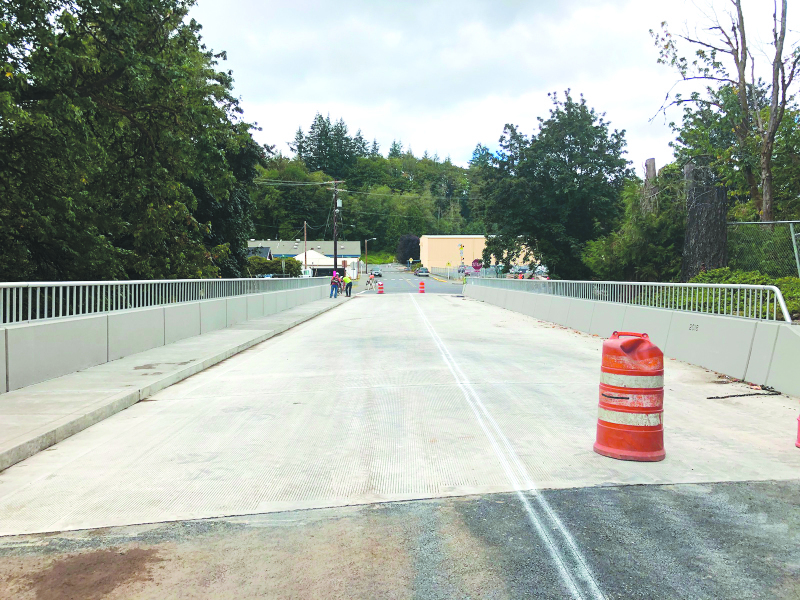 In honor of the new bridge opening, the City of Winlock, Winlock School District, Winlock Historical Society and the Winlock Improvement Network will be hosting the opening of the bridge and later in the early evening hot dogs, drinks and music will be available. Beginning Friday, September 7 at 9:00 am the students from Winlock Miller Elementary will walk across the bridge to celebrate the long awaiting bridge opening. When the Fir Street Bridge was opened the first time in 1960, students crossed the bridge. The City of Winlock has decided to carry on the tradition of having the grade school students cross the bridge. The picture of the previous crossing was in last week's Town Crier. Then, in the evening Winlock Improvement Network will be hosting music, hot dogs and drinks at the corner of Fir and Arden streets from 5:00 p.m. to 6:30 p.m. If the weather is not cooperative then they will meet at the Winlock Community Building. When the old bridge was opened, back in the day of big engines and big cars, Sam Zion and David Mickelsen had a race to see who could be the first to lay rubber on the road. Per Sam, "David and I ran to our cars, we both wanted to be the first to lay rubber on the bridge" and with a big smile Sam said "I won!" It is an honor that Sam is very proud of to this day. Sue Lindeman (Mickelsen) remembers all the maple trees around the bridge and when fall would come, the leaves would lay on the bridge; it would be like driving over a "golden carpet." Many of us have memories of the bridge, some even remember it was a walking bridge first. Many of us remember the path we walked every day to school back in the days. We would throw rocks off the bridge into the Olequa river and the boys would spit as far as they could. It was just some of the things we did around Winlock for entertainment long before the internet and gaming became available. When we look back, we realize, we took the bridge for granted just because we thought it would always be there. We didn't think the bridge would get old like us but after three Mayors, the bridge is finally completed. Winlock has seen a lot of changes in this past few months and the bridge opening is just one of many positive things happening in Winlock. When you drive or walk over the bridge, I hope it brings back as many memories for you as it has for us who walked over it for school. Many of us remember walking over the bridge for football games at the field with the old grandstands in the distance. With the new bridge, new memories will come, And someday, someone will be writing about this bridge getting old.